It's a beautiful 75 degrees and the sun is shining in Montecito and Santa Barbara, summer is definitely underway! In honor of graduations and great weather, let's tour an incredible compound built by the John Deere family in the early 20th century and once owned by legendary actress and comedian Whoopi Goldberg, which just so happens to be the ideal location for a kid (or adult!) summer camp. The compound is nestled between lush mature landscape of wildflowers and oak tree canopies. Nestled between Santa Barbara and the Santa Ynez Valley, the original adobe hacienda has been restored and elaborated upon to what is now an incredible wonderland. With multiple residences and 180 acres of spectacular grounds, the property is absolutely ideal for summer gatherings and weekend getaways for the whole family. The main residence boasts almost 6,000 square feet of living space and four additional guest houses with multiple bedrooms and bathrooms provide private quarters for your closest friends and family. An expansive entertaining terrace boasting an outdoor kitchen can host over thirty for dinner. The kids won't be disappointed by the plethora of playful amenities the property offers. An infinity pool with pool house, media area and game room are just the beginning. A tree house and fort, bocce ball court, lighted sport court and 3 miles of walking trails are waiting to be explored. Oh, did we mention the 150 foot long zip-line? Adults won't be missing out on the fun, the property offers a wine cellar and a 300-vine syrah and grenache vineyard. Don't worry - you won't have to maintain this vineyard yourself, the famous Beckmen Estate tends the vines. An outdoor fireplaces at Deer Lodge. The infinity pool overlooks the Santa Ynez Valley and Deer Lodge's Bocce Ball Court. The expansive kitchen is warm and wonderful gathering area. 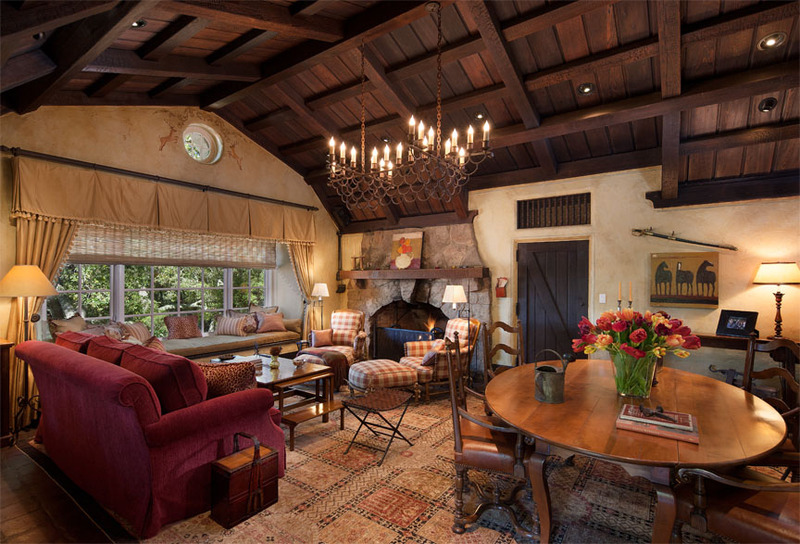 Deer Lodge is one of Santa Barbara's most incredible and serene properties. Discover this most unique treasure trove of amenities offered at $10,900,000. For more information, please contact Montecito's number one real estate team, Riskin Associates.